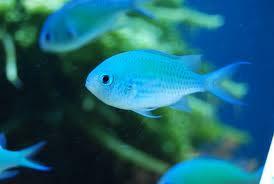 The Blue and Green Chromis is another all time favourite amongst reef keepers. With a captive maximum size of around 8 cm and it's ability to adjust well to aquarium conditions it is a popular addition to reef aquariums and is one of the hardiest little fish available. They will happily feed on most prepared foods such as flake, mysis, brine etc. These fish can be kept in shoaling groups and can make an excellect spectacle in the home aquarium.